The burgeoning crossover market is seeing many newcomers, just about every automaker out there either has a model or two competing in the segment, or they’re making plans to enter the hotly contested market with an offering of it’s own. A few automakers have been there since the inception of the crossover and what this means is that they’ve done their homework and paid their dues and the experience gained shows in their offerings. There are a few that are market leaders and BMW is one of them. It’s latest in the mid-sized segment is the BMW X3, and the automaker has managed to make it a favourite by catering for those with more needs than what the smaller X1 offers and less than what’s packaged in the big X5. As with other cars in this segment, the taller, more utilitarian CUV shares its underpinnings with the ever-popular BMW 3-Series. With such a great platform to star things off with, you’re pretty much guaranteed that the BMW X3 will be one of the better CUV options out there, a benchmark if you will. Underpinnings shared, but what about in the cabin? There are three versions available in the States, the sDrive28i, the xDrive28i and the xDrive35i. This is one of those cases where a BMW is a BMW is a BMW, and that’s not necessarily a bad thing. There are three versions available in the States, the sDrive28i, the xDrive28i and the xDrive35i, so we’ll start off with the base model that starts at a cool $39,250. The typically BMW cabin can be had with seven different leather types, two SensaTec fabrics and four trims that include woods and our choice, brushed aluminium. All at an extra charge, but the base model sees fitment of Burl Walnut Wood trim with a Pearl Gloss Chrome accent. Seating is good, bolstering is more than adequate and you can get into the perfect position with them being 8-way power-adjustable with a memory function that extends to the mirrors. As with the sedan that the X3 is based on, there’s climate control (with a memory function that keeps the most recently used settings), plenty of storage space for everyday items and an audio system comprised of 9-speakers and 205-watt digital amplifier. iDrive is there to control functions on all the systems, but they’re also all accessible via the multi-function steering wheel. The cabin layout is very good, but at the same time it’s not that exciting. The cabin layout is very good, but at the same time it’s not that exciting. 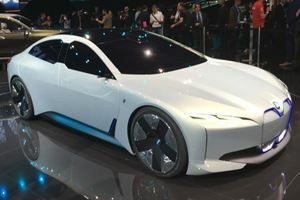 This is something we’ve come to expect from the clinical German automaker. Everything has a place and there’s a place for everything. There are options that can be added to the interior to get raise the spec level, and like with Mercedes-Benz cars they usually come at a hefty premium. The options are divided into packages that range from as little as $950 and can also be as much as $3200, but the latter is called the Premium Package so that makes sense. The one to have would be the Technology Package that features real time traffic info, navigation, more menus on the instrument cluster and a head up display. We’d also combine this with the Dynamic Handling Package that has variable sport steering and dynamic damper control. Not that this is the kind of car you’ll be testing the handling limits on, but having options that make the taller and more spacious CUV feel almost exactly like the sedan 3-Series is a plus. There’s space for five, and they won’t ever feel cramped unless they’re a starting line up. Boot space is also good and for those times the CUV will be used to carry extra luggage around the rear seats can be manipulated to free up space into the cabin, although this would see you leaving the rear passengers to catch a lift elsewhere. The turbocharged four delivers 240 horsepower with 260 lb-ft of torque. The great thing about the BMW X3 is the drive. We keep saying things like “typically BMW” and that’s because BMW has been making cars for so long, especially cars regarded as premium models, that you really don’t get a BMW that offers up a bad drive. The automaker has all the right technology in all the right places to make models fitted with the smallest engines feel silky smooth. The only time one of the entry level BMWs will disappoint is when you’re used to more power and entry-level cars generally have lower power. Even on these models, the way the engine is set up, it will give you the optimum power at all times. The turbocharged four delivers 240 horsepower with 260 lb-ft of torque and it sends power to the rear wheels in the X3 sDrive 28i, but if you spend more the same lump powers all four wheels in the xDrive28i. The power delivery is smooth through the entire rev range and only starts to fizzle out when you’re way above legal speeds, so that shouldn’t really be an issue for your average Joe who wants a good, premium CUV. The BMW X3 makes use of that brilliant ZF 8-speed transmission. 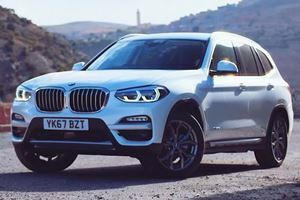 The BMW X3 makes use of that brilliant ZF 8-speed transmission that can be found in a few different cars in this segment from rival automakers. The control module is set up just right on the X3 and it allows the transmissions to switch between the gears seamlessly and quick and it manages to keep the revs at the optimum spot to keep fuel economy figures looking good, but also ready to switch down in an instant when a lower gear is needed for overtaking. It’s also programmed to basically disconnect from the drivetrain when coasting at speeds between 30 mph and 100 mph to further save on fuel usage. With the Driver Assistance Package parking becomes an easier task with added front and rear parking sensors and a rear-view camera that displays on the infotainment screen, assuming that’s been optioned too. With the Driver Assistance Plus Package BMW adds in its lane-departure warning system, frontal collision warning, pedestrian warning, city collision mitigation and parking cameras with rear and top view. While they’re not must-have systems, they’re something you should look at adding when ordering an X3. 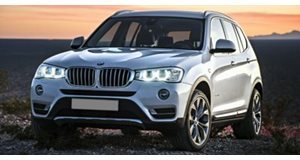 For the American market, the BMW X3 is available with just two engines. 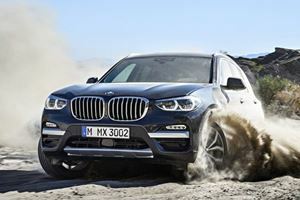 For the American market, the BMW X3 is available with just two engines, the aforementioned turbocharged 2.0-liter four cylinder with 240 horsepower and 260 lb-ft of torque, and the range-topping turbocharged 3.0-liter inline six cylinder that produces 300 horsepower and a matching 300 lb-ft of torque. In other markets the BMW X3 can be had with diesel powerplants in either a 2.0-liter four cylinder guise or a 3.0 six cylinder, and if international reports are to be believed, we’re missing out on some special cars. Even though we praise the transmission, the fact that BMW puts it in everything should be testament enough to it’s brilliance. The ZF transmission in this 8HP variant is one of the best on the market, which is why you’ll find it, or a very similarly set up ZF 8HP, in many cars from many automakers from Alfa Romeo to Volkswagen. The transmission first saw use in a BMW model when the 760Li made its debut in 2009 and has since been in every car from the automaker. Even though we praise the transmission, the fact that BMW puts it in everything should be testament enough to it’s brilliance. You get the smooth, flowing normal driving changes, but when you’re in a hurry and you’re going for the maximum speed the transmission can change between gears in just 200 milliseconds. When the car becomes laboured and a downshift is needed, the transmission can drop from 8th right down to 2nd if the conditions dictate. How premium is a premium CUV? Some options really should be standard features, and others are not 100% essential. The X3 model range starts off with a base price of $39,250, and as in the norm for BMW there’s an extensive options list to take that price much higher. Some options really should be standard features, and others are not 100% essential, but they would make life with the car a lot better. If looks are important you need to find a way to afford the $2,600 M Sport package. The M kit, sports seats and matching steering wheel, the Satin Aluminum kidney grille, the black high gloss window surround and roof rails and the M Sport double spoke 19-inch wheels really do give the car a much better profile. The list of the things we’d like to add to a base model X3 isn’t what you call extensive. Over the M Sport package we made sure the X3 would have Black Sapphire Metallic paint, a black Nevada leather interior with brushed aluminum trim, the aforementioned Driver Assist, Dynamic Handling and Technology packages with a few unnecessary things but that we thought could provide a complete X3 wanting for nothing. The online configurator returned a total MSRP, as built, of $61,704. Segment competitors are really quite similar. Segment competitors are really quite similar though, with a good base to start from at a seemingly bargain price for a top marque brand, once all the bells and whistles start getting added into the mix you can start to see your month food budget to decrease so that you can add to the new car budget. That increase of $22,454 looks closer to a second low mileage pre-owned car than a list of options fitted to a car already costing nearly forty grand. To option and buy or not? The thing with BMWs is that once a person, or family, has had a BMW, they tend to stay in the fold for all future car purchases, and so the BMW X3 will likely end up in the driveways and garages of many BMW-driving households. But even those families have been eyeing out the competition, and we can’t blame them. The closest competitors have traditionally been from fellow German automakers Audi and Mercedes-Benz, but for equal quality, if not superior rival options, there’s the Porsche Macan and the hugely popular Jaguar F-PACE. The Macan S is has a similar set of features and technologies packed in it and that starts off at $54,400. The top of the range Jaguar F-PACE features that brilliant 380 horsepower supercharged V6, the same ZF transmission and an excellent all-wheel drive system and also sports a rather long list of standard features. If you wanted that one you’d spend just $57,700 and you’d save yourself just on $4,000 on the X3 as we optioned it. The fast-growing CUV market really is a tough one, the dealerships all want your money and you want their cars, so it’s possible that the only was buyers will be making concrete decisions on a new car is with special trade-in deals and incentives. The BMW is a great offering, but have you seen an F-PACE up close? Get used to BMW pouring money into Cluster Architecture-based crossovers. EV and autonomous tech R&D is not exactly cheap. A little off-roading? No problem. Escaping zombies? No chance.